ABOVE: The entrance to the Mall in Aventura, FL. The Aventura Mall is home to 280 stores, 8 restaurants, and an AMC 24 theatre. Wi-Fi is available to customers free of charge. 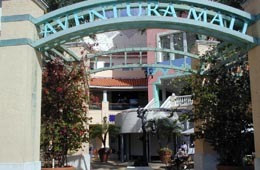 Aventura Mall enables you to connect to the Internet from any common area within the mall. Dining options include quick stops in the food court to upscale restaurants such as Cheesecake Factory, Rosalia's, Bella Luna, Johnny Rockets, and Sushi Siam.